Buy Shadows over Camelot and PriceWatch, Buy this board game at the Lowest Price. Shadows Over Camelot is a cooperative strategy board game featuring King Arthur and his Knights of the Round Table. It incorporates the many quests from the Arthurian legends, as well as the many evil forces that the Knights had to face. This board game by Days of Wonder will require you to work together to defend Camelot as the world around you slowly descends into turmoil. You will join the Knights of the Round Table and help King Arthur defend Camelot from the forces of evil in Shadows Over Camelot! Face the Black Knight, the Saxons and the Picts; and embark on quests to retrieve Excalibur and the Holy Grail. Work with the other Knights to prevent Camelot from succumbing to attacking siege engines and the evil Morgan. Be careful though, as there may be a traitor in your midst. The game is played on several boards depicting the various quests that you can complete. There is a main board featuring Camelot and the Round Table, the battle with the Saxons, the Pict invasion and the Tournament with the Black Knight. There are also side boards, such as the quest for the Holy Grail, the quest for Lancelot's Armor, the battle with a big bad dragon and the board for Excalibur and the lake. Winning the game will require you to successfully complete these quests. There is space for twelve swords on the Round Table in Camelot, and the game ends once all twelve are filled. The Knights win if there are more white swords than black ones. Otherwise, the evil forces have destroyed Camelot. White swords are generally obtained by successfully completing quests, while black swords appear if the quests are failed. The number of swords obtained depends on the difficulty of the quest involved. Your goal is therefore to work together to make sure that enough quests are successfully finished by the time the game ends. Each player gets to take on the role of a famous Knight, from King Arthur himself to stalwarts such as Sir Galahad, Sir Gawain and Sir Tristan. Each Knight also has a special ability unique to him. For example, Sir Tristan can move from Camelot as a free action, while King Arthur has the ability to trade cards with other players. The gameplay is pretty straightforward. Players take turns to perform an action, which includes healing yourself, moving from one quest to another, playing a special White card (powerful cards that have useful effects) and playing quest cards. Knights at Camelot can also use an action to draw cards. Playing quest cards will depend on which quest you are working on. The Quest for the Holy Grail will require you to play a Grail card from your hand, while defeating the Saxons or the Picts requires playing attack cards in increasing sequential order. The quests also have other restrictions; for example the Black Knight and Lancelot's Armor quests only allow one Knight to work on them at a time. You don't have all day to complete these quests though, as the game is constantly working against you. There is a stack of Black cards that have really bad effects, such as causing more Picts or Saxons to arrive, or reversing progress on the Grail quest, or even causing each Knight to lose life! At the start of each player's turn, they have to make a choice: play one of these Black cards at random, sacrifice 1 life (out of an initial 4 life points), or choose to place a siege engine outside Camelot. Sacrificing life is noble, but things will go downhill if the Knights all start to keel over. Siege engines are dangerous as well; once there are twelve siege engines outside Camelot, the Knights automatically lose. However, Knights located at Camelot are able to use use attack cards to destroy siege engines as an action. So the game basically boils down to good coordination and teamwork. The mechanics are pretty straightforward, with simple choices to make. What's difficult is making sure everybody is on the same page on how to hold the evil forces at bay. The last thing you need is a Don Quixote type hero going off on his own to fight the Dragon while Camelot is about to fall before a Saxon invasion. Keep the Knights working together and each obstacle will fall in turn. However, things aren't always that straightforward in heroic tales. Shadows Over Camelot is no different, as not all Knights may have Camelot's best interests at heart. At the start of the game, loyalty cards are handed out in secret, and there is a chance that one player has been assigned the role of traitor. While the traitor is still hidden, he can undermine the Knights' efforts by pretending to play badly or by wasting his turn performing sub-optimal (but innocent-looking) actions. This of course adds a whole new level of second-guessing and uncertainty to the game, and makes it so unpredictable and exciting. It can also bring the group down to a level of suspicion and finger-pointing. Players are able to use their action to accuse another player. If the accusation turns out true, the Knights win a White sword. A false accusation will turn an existing White sword into a Black one. However, being accused and revealed does not mean the traitor is now helpless. He still reveals Black cards or places siege engines each turn as per normal, but he also now gets to steal a card from another player's hand as his action. 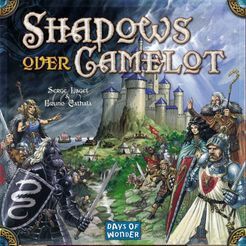 Shadows Over Camelot is an exciting game in which you get to relive the legends of King Arthur and defend Camelot from all kinds of evils. It is one of the rare board games that can be played by 7 players, and is also one of the few cooperative board games. The mechanics aren't difficult to learn, but what makes it engaging is the teamwork required and the suspense surrounding a possible traitor. You will like Shadows Over Camelot if you like other cooperative games such as Battlestar Galactica or other medieval fantasy games such as Dominion or Small World.